This recipe is perfect for using left-over roast chicken or even turkey at Christmas, but a shop-bought cooked chicken also works well. To make your own béchamel sauce, simply melt 25g (1oz) of butter in a pan, then stir in the same amount of plain flour and cook for 1 minute. Gradually add 450ml (3/4 pint) of milk until smooth and then simmer for a few minutes; season to taste. Preheat the oven to 190C/375F/gas mark 5. Strip the meat off the bones of the chicken and shred or cut into bite-sized pieces – you’ll need 450g (1lb) in total. Place in a bowl and set aside. Blanch the broccoli in a pan of boiling salted water for 2-3 minutes, then drain and refresh under cold running water. Tip on to kitchen paper to drain completely. Heat the béchamel or cheese sauce in a large pan and whisk in the stock and crème fraiche. Bring to a simmer and then cook for a few minutes until you have achieved a thick pouring sauce, stirring occasionally – you should have about 600ml (1 pint) in total. Season to taste. Melt the butter in a small pan and sauté the onion for a few minutes, then stir in the breadcrumbs, herbs and season to taste. 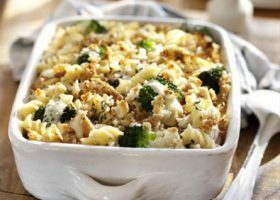 Arrange the cooked chicken pieces and broccoli florets in a greased shallow ovenproof dish and spoon over the sauce to cover completely. Sprinkle the breadcrumb mixture on top and bake for 20 minutes until bubbling and golden brown. Transfer on to warmed serving plates and serve at once.